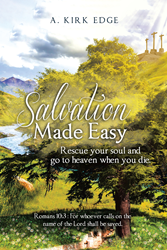 Recent release “Salvation Made Easy: Rescue Your Soul and Go to Heaven When You Die” from Page Publishing author A. Kirk Edge is an exploration of the concept of salvation and the guidelines found in Scripture for achieving an eternal relationship with God. A. Kirk Edge, a Christian husband and father of two, has completed his book “Salvation Made Easy: Rescue Your Soul and Go to Heaven When You Die”: an easy-to-follow guide to an eternity in paradise. He continues, “These are just a few of the important things you need to know and will have definite biblical answers to after reading this book. “Salvation Made Easy” is not an autobiography of Mr. Edge’s life like so many books with important sounding titles are these days. Mr. Edge kept the book focused on the task at hand in explaining to the reader just how vitally important each person’s relationship with God really is. The author does sprinkle in bits of humor along the way, which puts the reader at ease and draws them deeper into the subject matter at hand. The book’s tone is not condemning in any way but does convey the importance of the decision to follow the Son of God. Published by New York City-based Page Publishing, A. Kirk Edge’s book examines biblical passages referring to eternal salvation and offers a guide to a fulfilling and infinite relationship with God. Readers who wish to experience this thought-provoking work can purchase“Salvation Made Easy: Rescue Your Soul and Go to Heaven When You Die” at bookstores everywhere, or online at the Apple iTunes store, Amazon, Google Play, or Barnes and Noble.